Eurosport is presenting itself as “The Olympic Broadcaster”. Since February 9, Eurosport is bringing exclusive coverage of the Olympic Winter Games from PyeongChang to 48 markets across Europe – marking a world-first with a single media company taking responsibility for such a huge share of the global audience, about 750 million people to be precise! Part of the unique offering is the commitment to achieve that through technological innovations, transformative partnerships, and an all-screen strategy. 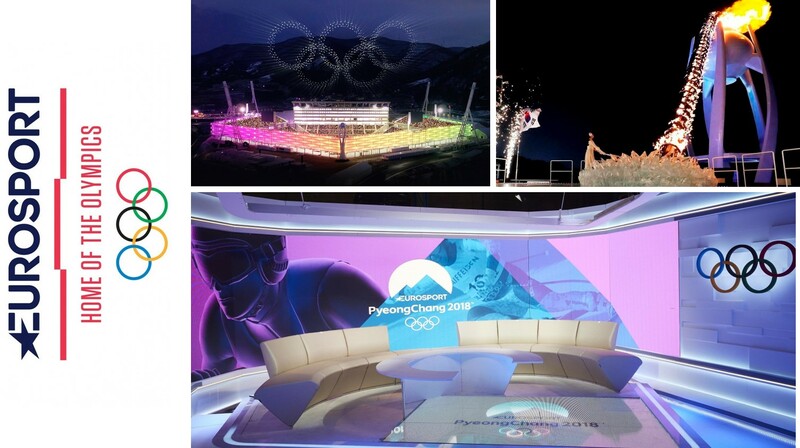 With real-life storytelling Eurosport is delivering the ultimate Olympic Games viewing experience, enabling audiences to enjoy every minute of live action from PyeongChang 2018, whenever and on whatever device they choose to watch it. From South Korea to Germany, Sweden, to Norway and Finland and to the United Kingdom, a total of 17 studios across the world are playing host to Eurosport’s cast of 150 winter sports experts and adding the local view on the events in PyeongChang. In Reference to the Chinese New Year Festival 2018 (Year of the Dog) we present five Chineese OBVans from all across China: From the west of China Gansu RFTV, from the north Hebei Radio and TV, from the northeast Liaoning TV, from the east Ningbo TV and from the very south Guangxi TV. The “Flying Prime Cam” cable camera system, owned by the German company HSD, has been introduced late 2017 and has delivered perfect pictures at the international Ski-Jumping and Ski-Flying events. It utilizes state of the art technology to allow the 5-axis stabilized camera platform “DynaX5” to “fly” down the slope with the jumper with up to 200 km/h, in a ballistic free fall. The HSD team has been in the industry for decades, with experience in all aspects of managing such sports events from technical, and organizational perspective. Slomo.tv multichannel video recording Super and Slow-Motion instant replay server Dominator AT/3G is capable of recording directly in NLE file formats. The system works with 3G SDI and HD/SD SDI signals. The 4U 19” size unit has 4 graphics ports and standard SSD storage capacity of 533 hours of 100Mbit. Intuitive main interface with built-in multiviewer and remote control facilitate instant access to frequently used functions enabling search, clip creation and editing during replay. Nils Frahm is a composer, producer and performer, and has a huge global fan base of music lovers who look beyond the mainstream. In the middle of January, he kicked off a tour at the Funkhaus Berlin, which will take him around the world for the next two years. Accompanying him on the trip Nils Frahm is taking an AURUS platinum from the Berlin-based manufacturer Stage Tec as his FOH console. At the end of January Nils Frahm released his seventh studio album ‘ALL MELODY’. It was created in the Berliner Funkhaus where the Berlin resident has his studio. The listed building in Nalepastrasse was the broadcasting centre of the GDR until 1990. This much anticipated, high profile and instantly sold-out gig – which saw Stone play a duo set accompanied by acoustic guitarist Leon Michael King – needed to be lit beautifully and appropriately, a task for which the theatre called on the talents and creativity of LD Ramon le Roux of A&R Technologies. Ramon chose to augment the house rig with Robe moving lights, supplied by Windhoek based rental company dB Audio, and he specified 12 x Robe Spiiders for the main wash fixtures and seven 600E Spots for the hard edged luminaires, all rigged on the house trusses. Ramon’s industry career actually started at the Warehouse Theatre, and he worked there as resident LD and lighting systems tech for around three years before spreading his wings, an experience that means he is well acquainted with what will and won’t work in the space. Lighting and show designer Radek Havliček of production company Pink Panther Agency s.r.o, was responsible for the tour's lighting and production design. Marking nearly two decades of creative partnership between Pink Panther and Kabat, Havliček's latest design stunned audiences with its immersive flair and sophisticated use of space. "The tour's stage spreads across most of a regulation-size ice hockey rink," explains Havliček. "It was the biggest stage that had ever been used on tour by a Czech band and included four pits or 'pools' for the most dedicated fans. For those within the 'pools' the band was literally surrounding them. In fact, most of the audience felt included - or immersed - in the show. It was not happening 'out there' or 'down there', it was happening all around." Our online catalogues currently present 503 HD OBVans/Trucks. These 503 HD OBVans are distributed accross all five continents and represent trucks with two camera channels up to trucks with more than 24 camera channels. We have analyzed the installed hardware and present following the market shares of 12 product groups. Cameras - Lenses - Vision Mixers - Displays – Multi-Viewer - Digital Glue - Video Routers - Video Tape/Disk Recorders - Video SloMo/SuperSloMo Devices - Audio Mixers - Audio Monitoring - Audio - Intercom Systems. With SD officially dead and HD the status quo, 4K- and HDR-capable trucks — as well as units featuring IP-based infrastructure — are on the rise. Of the 503 mobile units covered in the survey, 49 are listed as 4K-capable. The Digital 6000 Series of radio microphones brings outstanding audio quality and rock-solid RF wireless transmission to demanding live productions and, as the microphone system of choice of an increasing number of engineers, integrators and suppliers for live performance, permanent installations at venue and for live-to-air broadcast, is fast becoming an essential part of many rental companies’ inventories, with Britannia Row, Stage Sound Services, SSE, Adlib, Capital Sound and Skan PA all having recently invested in substantial systems. After successfully delivering its first UltraHD HDR production for DirecTV’s NHL broadcast in December, MTVG opted to produce all live 4K shows for clients in HDR moving forward. “We’re big on picture quality and always looking at technology like the FS-HDR that can help us advance the quality of content for audiences. Our clients also love the extra punch that HDR offers, and from a production standpoint, you get more bang for your buck, so the move to HDR has been a win-win for us,” said Wehner. HDR displays, however, are not standard in most homes yet, so when MTVG delivers an UltraHD HDR broadcast, it simultaneously produces a live HD 1080i or 720p SDR feed, which a majority of the audience sees, in addition to a 1080p HDR feed. The innovative solution has been developed with Blackmagic Design infrastructure products at its core by broadcast consultant, Stvdio Expert’s Peter Knowles. “Derby County has a unique vision of where the club wants to be in terms of delivering high quality content to its 300,000 fans across the globe,” he begins. “The wider brief set by Matt and Stuart was incredibly ambitious - to put in place the facilities required to produce content that would rival that of the major broadcasters.” In covering home matches, DCFC currently relies on eleven camera channels, and according to Knowles this continues to grow and evolve. The compact and lightweight CJ12ex4.3B professional lenses deliver high-quality 4K resolution to 2018’s line up of live sporting events alongside the UHD DIGISUPER 90 and CJ20ex7.8B. The CJ12ex4.3B lens offers 12x zoom and a focal length that extends to an exceptional 4.3mm at its widest to 52mm. The UHD DIGISUPER 90 retains stunning 4K resolution even with image stabilisation applied and features a 4K 2/3” field lens with 90x zoom and 9-810mm focal length – up to 1620mm with the 2x built-in extender. Thanks to its wide focal range, it is the ideal camera to cover wide spaces such as sports arenas with a single lens.